Located approximately fifty miles northwest of Oklahoma City, Geary is situated in Blaine County at the junction of U.S. Highways 270 and 281. The area was first opened to non-Indian occupation during the Cheyenne-Arapaho Opening in April 1892. A townsite company bought two quarter sections of land from Shubell Huff and his son William, who had filed claims after the land opening. The community was first located one and one-half miles northwest of its present site. When the settlers learned that the Choctaw, Oklahoma and Gulf Railroad that was being built west from El Reno would miss that location, they moved southeast toward the railroad line. The town was named for Edmund Guerrier, a scout and an interpreter for the U.S. Army. Guerrier, who was of French and Cheyenne descent, had an allotment three miles northeast of the townsite. Because Guerrier was difficult to pronounce, the town's name became Geary. A post office was established on October 12, 1892. Businesses and churches rapidly appeared. In fall 1898 Jacob S. Krehbiel, a Mennonite missionary, had his church building moved from near his home north of Geary into town. In 1899 the Presbyterians constructed a frame building on Blaine Avenue. The congregation disbanded in 1916, and the church remained vacant until 1921 when the Church of Christ purchased it. As a trade center for the local agricultural area the town was designated a "first class city" in 1902 when the population of 2,561 exceeded the two thousand requirement. By 1907 statehood the population had declined to 1,565. Local citizens patronized a dry goods store, grocery stores, hardware stores, three lumberyards, three banks, and two bakeries. The town also supported a rooming house, a flour mill, a broom factory, a bottling works, cotton gins, grain elevators, and eleven saloons. A telephone system and electric power were soon established. Early newspapers, such as the Geary Bulletin and the Geary Journal, informed the citizens. The First National Bank, known as "the oldest bank in Blaine County," was the first business constructed in the new town. Beeks Erick founded the bank, and John Dillon served as its first president. In 1903 G. F. Gillespie built the Bank of Commerce, later known as the American State Bank. Although the bank failed during the Great Depression, the Gillespie Building, listed in the National Register of Historic Places (NR 89001963), houses the Canadian Rivers Historical Museum. By 1912 Geary was served by the Postal Highway, which later became part of U.S. Highway 66 (Route 66). In 1928 Andrew Payne, winner of the Bunion Derby, came through Geary on that highway. 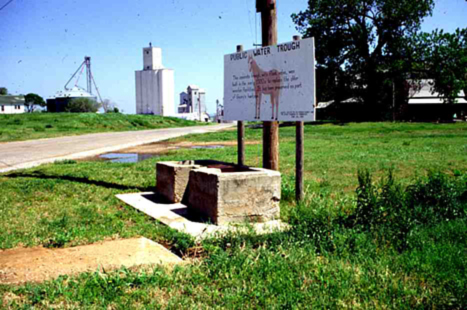 Located eight miles northeast of Geary, the site of Jesse Chisholm's grave was added to the National Register of Historic Places in 1971 (NR 71000658). The U.S. Census registered 1,167 inhabitants in 1920, 1,488 in 1940, 1,416 in 1960, and 1,700 in 1980. At the turn of the twenty-first century Geary had an aldermanic town government, and its population of 1,258 was served by the weekly Geary Star. The U.S. Census found 1,280 residents in 2010. "Geary," Vertical File, Research Division, Oklahoma Historical Society, Oklahoma City. Merle Rinehart, "Geary," The Encyclopedia of Oklahoma History and Culture, https://www.okhistory.org/publications/enc/entry.php?entry=GE001.